The Opener! Every year, at the end of summer, I'm ready to go. There's a little boy hope in me that, perhaps, it won't be so hot this year. Maybe a cold front will swoop through and give us a week of perfect hunting weather before the 90's come back. It was not to be. The weather was seasonally hot. 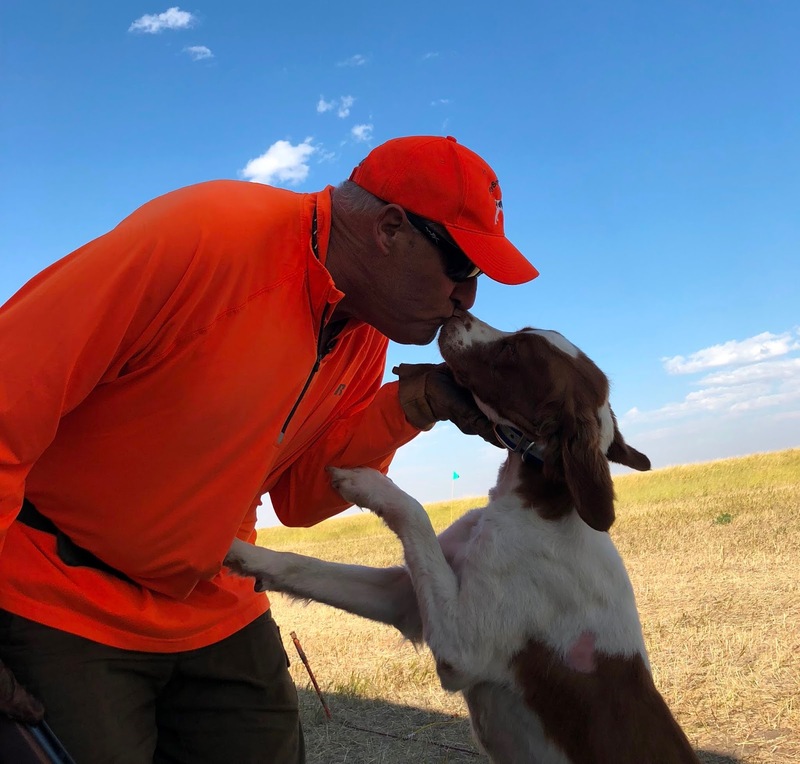 Since I judged, and competed at a NSTRA field trial in Great Falls the first three days of September, I was well aware the local weather would be cool at night and warm to hot during the day. Shack getting some love for his work. The trial served as a warmup for the dogs. 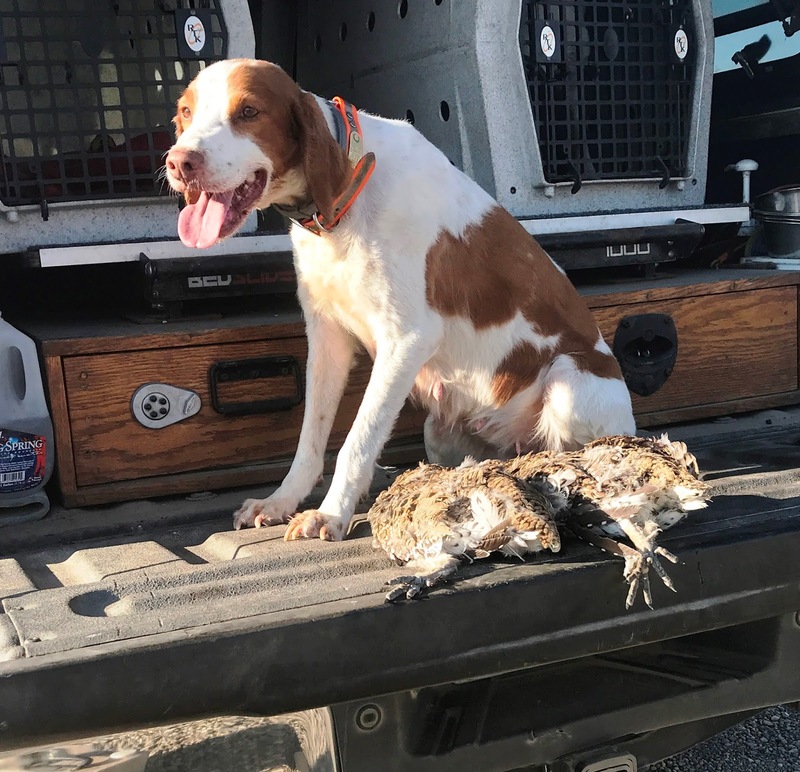 They use Chukar for the trial, and it's always fun to see the first few finds from the various dogs. The older one's will roll into the point with practiced nonchalance, "Here he is, Boss. Pretty much smells like a Chukar.". The younger guys may stutter a bit, but will recover well as they lock up, "Crap, Boss! This one smells pretty good! It smells big. I hope you're ready!" Either way, they get to transition from pen-raised birds to something a little more exotic. 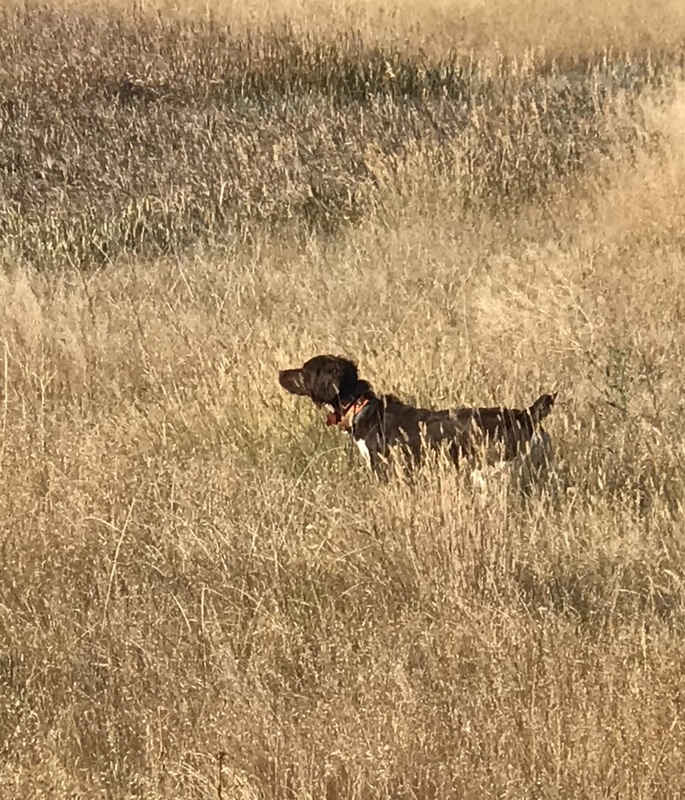 Overall, my dogs (I only ran Shack and Cap, the two males, in the field trail) did very well. 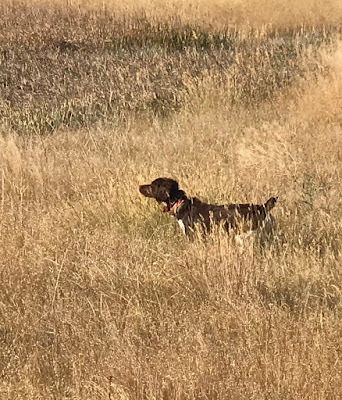 I was very pleased with the results (3 Firsts, 2 Fourths) over the two days they competed, but I was more pleased with the non-tangibles of obedience, style and headwork. We moved north and hit the ground early the next day. As predicted, it was a cool morning, but heated up fast. The hunting was on Block Management land, Open Fields for Upland Birds land, and State and BLM land. If you go to Montana without a way to identify all these types of land, you'll be hurting yourself. Sometimes, you'll be heading to a nice piece of Block Management when you'll see some really nice habitat. Checking the map, you notice it's State Trust Land, and open for hunting. It might be the next great honeyhole. In the old days, books mailed from the state and maps from the BLM office littered the front seat of the truck with notes scribbled in margins with phone numbers, directions, names, etc. and with circled areas to hunt and others to avoid. In the modern era, I still have the paper, BUT I also use GPS technology. 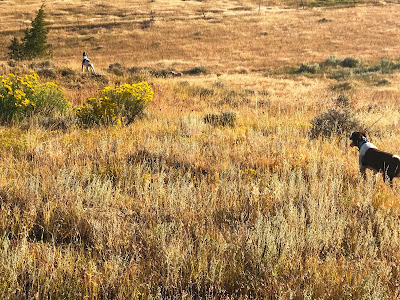 There are several apps out there for iOS and Android that will make your hunt way more enjoyable. I have evaluated two and you can read about them here. The routine varied little over the next few weeks. 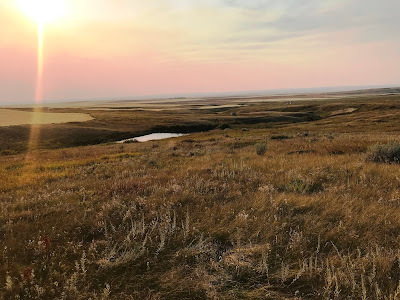 Up before light, on the road after coffee, in the field as the sun came over the hills, break at noon, nap in the shade, back in the field around 5 for a few more hours, back to the camper after dark. I'm always asked about snakes- Prairie Rattlers. I, personally, saw no snakes. 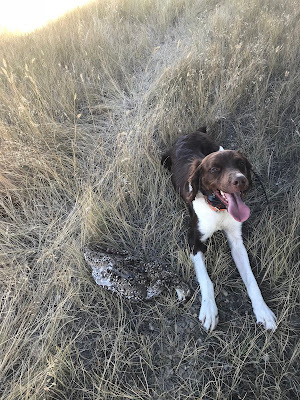 My hunting partner saw a few and had one Prairie Rattler strike at one of his dogs with no contact. We usually see a few every year, but this year I never saw even one. I did, however, have one medical emergency. Pearl had a discharge and seemed to be feeling poorly, so I took her to the local vet. Pyometra was diagnosed and she was spayed the next morning. Diagnosis was confirmed, and my vet and the local vet agreed that we probably saved her life. "Don't let the sun go down on Pyometra!" was what my home vet told me. When we opened her up, I saw why. Google it. Don't mess around with it. So, for the 2018 season, here are my impressions of the sharptail (and Hun) season in Montana. It's a very poor year, statewide. You'll see pictures of dead sharpies and Huns here. The total number of birds I harvested for nine days on the ground, hunting hard, was 8 Sharps and 2 Huns. I felt lucky to have bagged those. Cap and Shack had a good morning. 4 Sharps and 1 Hun. We hunted west, north to Canada, and east to the Dakota line. 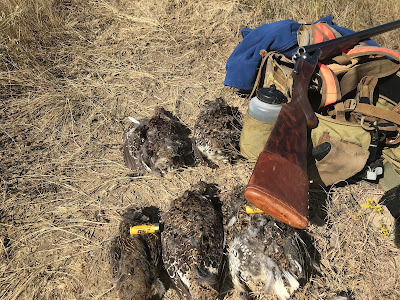 I talked to landowners, ranchers, vets, and even a FedEx driver- conditions are perfect, the bird numbers are very poor. I'd even hazard a guess that they are worse than last year. Just to be clear, I feel confident that I know how to hunt these birds, and I know where to go. There are "pockets" of birds, where you might see several large coveys. But, overall, you'll see much fewer than normal. I wish it were different, but it is what it is.